As teams close out the first part of their season and prepare for conference play in their respective conferences, I share who my favorites are to win each conference and who can expect to challenge for the top spot. The Vermont Catamounts are quietly putting together a solid campaign. The Albany Great Danes are the most likely to push Vermont and end up stealing their spot in the tournament come March. The AAC has been disappointing this year and that’s an understatement. The only threat to make noise in the tournament is a tough Cincinatti team. Most other teams in the conference fall into the middle to low tier when comparing them to other major conferences. The biggest challenger to the Bearcats is SMU. After having one of the best records and not going to the tournament due to serving NCAA violations, SMU can be the second best team to make the tournament. This conference is always so interesting as it can produce a wide range of tournament berths from year to year. The Dayton Flyers are my favorite, but it will be a close race to the top with the likes of Rhode Island, VCU, and even Davidson. Dark horses to challenge the top contenders are St. Bonaventure and La Salle. My top 6 is any variation from these teams, but I expect Dayton and Rhode Island to vie for the top spot. I have Florida Gulf Coast is the favorite to win this one-bid league. I don’t see any team challenging FGCU for the bid to the NCAA tournament unless a major upset occurs in the conference tournament. This is a very tough choice to make, mainly because I don’t want to pick against history. Kansas has won the regular season title 12 straight years. I’d love to pick Kansas to win because they are so consistent during the regular season. They will have a strong challenge from West Virginia. The Mountaineers are slightly more efficient in Ken Pomeroy’s ratings. I’m excited to watch their matchups when they play each other. Baylor has a legitimate chance to make some noise based on their body of work early in the season. I don’t foresee other teams in this conference finishing in the top 3, but I do think the Big 12 sends at least 5 or 6 teams to the tournament. The Villanova Wildcats are the favorite to win the Big East this year. It won’t come easy due to the upper half of the conference playing very well. Creighton has been the dark horse to this point, with an unexpected, yet impressive, undefeated non-conference. The Blue Jays issues will be on the defensive end, as they aren’t as efficient in protecting the rim as Butler, Xavier, Providence, or Villanova. Expect Villanova to be pushed in games against Xavier, Creighton, and Butler. Butler is still looking for their first win over Villanova – January 4th at Hinkle Fieldhouse is their best opportunity this year. This is an odd conference to try and predict. The most efficient team on offense in the conference is almost the least efficient on defense (and in the nation). That title belongs to Eastern Washington. Because of that, I see them finishing in the middle of the pack in their conference. North Dakota is my favorite to win this conference and they will feel pressure from both Weber State and Montana to become conference champions. I see the Big South as a horse race between Winthrop and UNC Asheville. I think UNC Asheville has the edge in this race, but we’ll see how that prediction holds through conference play. The Big Ten will be fun this year mainly from the state of Indiana perspective because both Indiana and Purdue have great opportunities to win. However, throw in the Wisconsin Badgers into that mix to win the conference. I give Wisconsin a slight edge to win out, but both the Hoosiers and Boilermakers will be nipping at the heels of the Badgers. There’s not much to say here. This is a bad conference and Long Beach State has not lived up to its darling, upset minded projection assigned to them at the beginning of the season. I think they end up winning the conference, but I also wouldn’t be surprised if UC Irvine claims that crown as they have the best defense in the league. This will be a fun conference to follow over the conference season. UNC Wilmington should win the regular season title with some distance between them and second place. This conference does include Northeastern, the team that has won at Connecticut, Vermont, Michigan State, and Oakland. Vermont and Oakland will vie for a conference championship. I’m curious to see how Northeastern’s conference play pans out. Conference USA is another odd study in which it may be tough to choose an absolute winner. I think the favorite to pick is Middle Tennessee. They have pushed themselves in non-conference play and play relatively efficient basketball on both offense and defense compared to other teams in their league. It will be a tight race for second if teams don’t beat Middle Tennessee. Old Dominion, Louisiana Tech, Rice, and Marshall all have legitimate chances at snagging the 2 seed when the conference tournament begins. How they acquire it will be interesting. Old Dominion is horrific on offense, but nearly compensate because they have such a great defense. Marshall can expect to be in most games because they run the floor and have a large number of possessions each game. Louisiana Tech has a balanced team on offense and defense, it is just less efficient than Middle Tennessee is. Rice is the opposite of Old Dominion. They have an efficient offense and an abysmal defense. The Horizon League is another conference with a two team race to win the conference. Valparaiso and Oakland will be the two teams to beat. I think Valparaiso wins the regular season with Oakland close behind. Expectations have changed for the Ivy League this year since having aspirations of sending two teams to the tournament to begin the season. The Princeton Tigers are my favorite to win the conference and automatic bid. The closest challenger is Yale and has a decent shot if they can beat Princeton head-to-head. Monmouth doesn’t get snubbed this year as they dominate their conference. I expect them to beat decent competition from Iona and Siena to make it to the tournament, a place they should have been last year as well. In the MAC East Division, I have Akron winning the division over Ohio. In the MAC West Division, it should be a tighter race between Central Michigan, Eastern Michigan, and Toledo. I think Eastern Michigan wins the West Division because they take care of the ball better, match each of the offenses well to those two teams, and have a better defense. This is a bad conference and the only inkling of goodness that comes from this conference is North Carolina Central’s average defensive efficiency. Because the teams in this conference are so bad, I wouldn’t be surprised if most of them finish within a game of .500 and North Carolina Central “runs away” from the rest of the pack because they don’t play as poorly as the other teams. Loyola Chicago has really impressed and surprised me this year. They are my dark horse to win the conference, but Wichita State is my favorite. The Shockers have fallen off a bit in my opinion, but I think they beat out Illinois State for the conference. I really would like to see Loyola do well. Northern Iowa also seems to have fallen off a bit as well. Is the MVC losing some of its oomph? The Mountain West should be fun this year. After reviewing numbers from Ken Pomeroy’s website, I’ve found that a team with a more potent offense than a stingy defense tends to be the winner in a game. If this is true, Nevada has the upper hand over San Diego State. SDSU hasn’t produced like they have in recent years and I would expect Nevada to take this conference, albeit in a very tight race. This is another conference where each team is mostly bad and that will result in a lot of teams at or within 1 game of .500. Two teams that will duke it out are Wagner and Mount St. Mary’s. Both teams have poor records right now, but will end up with winning records after beating up their conference foes. Ah, the Ohio Valley. This will be fun because in the East Division, there will be a fun race to follow between ever-present Belmont and up and coming Tennessee State. I think Belmont wins out because they have better offensive firepower. In the West Division, Murray State is my favorite to win with UT-Martin as a possible option to knock Murray State out of the 1 seed for their division. I can’t wait to see how this conference pans out this year. There are promising teams that haven’t been relevant in a while from the Pac 12. UCLA is my favorite to win the league, replacing Arizona from my original choice. Arizona doesn’t seem to have found their identity due in large part to injuries. I think Arizona, Oregon, and USC give UCLA good competition, but it’s hard to beat a team that is so efficient and fast paced every time they take the floor. My dark horse for the Pac 12 is Colorado. Remember, last year, when Holy Cross finished ninth in the conference and won 4 straight away games to earn the bid for the NCAA tournament? I don’t expect most to remember. Those are the stories I love about college basketball. I don’t think it will happen again in this conference for a long time (but boy I hope I’m wrong). This will be a fun conference to watch because Lehigh, Bucknell, and even Boston has a chance to win this conference. I think Lehigh and Bucknell are more consistent teams and eventually Lehigh wins the conference. Amazingly, the SEC only sent 3 teams to the tournament last year: Kentucky, Texas A&M, and an undeserved Vanderbilt team. This year, I think the conference can send 5 teams – Kentucky, Florida, South Carolina, Texas A&M, and possibly Arkansas. Here’s how I see the SEC standings at the conclusion of the regular season. There are two very good teams that can be dangerous to play in the tournament should either get there in March. This conference is, yet again, a two team race to the top between Chattanooga and East Tennessee State. I think Chattanooga wins the conference with ETSU finishing second. Stephen F. Austin’s reign as the dominant team in the Southland Conference has come to an end. At one point, the Lumberjacks had compiled an outrageous 69-3 conference record over a 3 year period. Unfortunately, there is not a real replacement as Sam Houston State looks the most promising to win the conference. On Ken Pomeroy’s standings, the SWAC ranks as the worst league. I think Texas Southern has the best opportunity to win the conference due to them having the “best” offense compared to their conference opponents. Their current record would lead you to think otherwise as they sit at 4 wins to 9 losses. However, knowing that two of their conference opponents are currently winless and the rest don’t have more than 3 or 4 wins, they won’t have much trouble. It is fun to see this conference doing so well. The top 5 or 6 teams have the capability to win on any night regardless of who they play during conference play. This is the same conference that sent RJ Hunter and his father into the tournament that took down 3 seeded Baylor and gave Xavier a good scare. It’s the same conference that sent Little Rock to the tournament and took down 5 seeded Purdue in double overtime. This year, I’m most impressed with UT-Arlington. I think they win the conference with Georgia State, Little Rock, and Louisiana Lafayette fighting for 2nd place. My favorite to win the Summit this year is Fort Wayne. Their closest competition is IUPUI and North Dakota State. The Summit League tends to have some great matchups. I had a blog post in early November that included a player to watch, Mike Daum. He plays for South Dakota State, a team that has a decent offense, but they are abysmal on defense. I’m disappointed in how their season has panned out and don’t expect much from them in conference play. The West Coast Conference has been dominated by Gonzaga. However, St. Mary’s, and BYU have taken turns closing the gap to Gonzaga over the past few seasons. St. Mary’s has a legitimate chance to win the WCC this year, but it will require them to beat Gonzaga. Their home loss to UT-Arlington is a bit concerning because St. Mary’s wasn’t really in contention to win for a majority of the game. I think Gonzaga ultimately wins the conference, but St. Mary’s puts up a good fight and that both make the tournament this year. I see three possible teams winning this conference: New Mexico State, Cal State Bakersfield, or Grand Canyon. I never thought I would list the third candidate, but here I am! Grand Canyon is a decent team and, having only been in Division 1 since the 2013-2014 season, its impressive work by Dan Majerle to lead the team to a 27-7 record last season. They are on pace for another great year and will push the others for that automatic bid in March. I think New Mexico State wins the conference, but Grand Canyon stays with them until the end. Well, I’ll monitor the landscape of each conference and can’t wait to see how things change over the next three months! I hope to see some unexpected teams turn their season around and challenge at the top. I’ve always been intrigued and inspired by the mystique of March Madness and the NCAA tournament. Growing up, the concept of competitiveness was always present in my everyday life. Having siblings younger than myself that were gifted athletically pushed me to work hard in the different sports I played. I also felt that competitive nature in the classroom as I went through school. Whether it was between siblings, friends, or with myself (I wasn’t the best student academically, which was humbling) I felt that desire to better myself (most of the time). There’s something special about watching NCAA basketball tournament games. I have a vivid memory of the first tournament game I watched. When I was still a wee lad in the 5th grade of March 2001, I stayed after school with the rest of the guys in our grade to watch a video of what to expect as I transition into middle school. After that video finished, we had extra time before we were dismissed, so the teachers turned on the NCAA tournament and it just so happened Butler was playing Wake Forest. The Bulldogs were up big when we tuned into the game and they ended up winning that game 79-63. My love for Butler began way before then, but witnessing a lower seeded team beat a higher seeded team with a group of people cheering loudly created a special memory. Once my friends, family, and I began filling out brackets, it became an annual tradition to compete to have the best bracket. As my interest grew in researching teams before making decisions on matchups in the tournament, I stumbled upon some incredibly detailed websites that explored how to choose a winning bracket or potential national champion. Unfortunately, most of those sites aren’t maintained because the men were doing those as a hobby as well, like I am currently. The detail in each site was incredible and forced me to think about things I never considered before. In summary, that’s the roundabout, abridged version explaining my interest in exploring the makeup of a team based on their statistics. To begin this exploration of what makes up a champion, I found the adjusted offensive efficiency data for each of the past champions dating back to the 2001-2002 season. These numbers are available on Ken Pomeroy’s website. I chose this season because that’s the furthest back the data goes. After finding these numbers, I entered the data into a graph to represent a visual of the efficiency ratings. These numbers are represented in the graph below. Let me explain what the numbers mean in the graph above. The x-axis is the year the championship was played. The y-axis represents the adjusted offensive efficiency. The numbers displayed on the line graph are the adjusted offensive efficiency numbers themselves. The point on the graph with a number above it is the specific adjusted offensive efficiency of the team that won the national championship. The number is the average for the entire season, not exclusively the championship game. These adjusted numbers are much higher, in most cases, than what the team typically scored over the course of the season. The number is representative of what each team would expect to score if they played one hundred possessions each game. The likelihood of a team hitting the century mark in each game during the season is small. The current teams that would even come close to that currently are The Citadel and revamped Savannah State. The numbers come from a formula created by Dean Oliver and tweaked by Ken Pomeroy. At first glance, there doesn’t seem to be that much of a trend with the efficiency numbers and winning the championship. The graph generally makes up and down fluctuations from year to year. However, understanding the rankings relative to high achieving teams from year to year helps to resolve the variability of “high” and “low” offensive efficiency numbers. Not all of these numbers are created equal. Incredible variations create different numbers for all teams from year to year. For example, when Duke won the 2015 title, they had the third most efficient offense in the nation that year at 122.5 points per 1oo possessions. Florida (2007), North Carolina (2009), and Duke (2010) all led the nation in offensive efficiency, yet had numbers lower than the Blue Devils team that won it in 2015. The closest of the three teams that led the nation in adjusted offensive efficiency was North Carolina in 2009 with a rating of 119.6. Duke holds a 3 point advantage when comparing their efficiencies. We must be careful in evaluating any trends and I think it would be foolish to find a trend or pattern because the volatility of a college basketball season. I’m going to make a claim that to be considered to vie for a championship, a team must have an elite efficiency on offense, or at worst, on the fringe of being elite. The rankings help develop a fuller picture of this. The low-end efficiency for teams that have won since 2002 is 111.1, whereas the high-end reaches up to 122.5. Where a team falls in the ranking of their efficiency on offense from year to year seems to be a determiner in their result for the tournament. Of the previous fifteen champions, nearly all of them ranked in the top 7 in offensive efficiency in Kenpom numbers. The only ones that didn’t were Syracuse (2003, 15th), Connecticut (2004, 10th), Connecticut (2011, 20th), and uh, Connecticut again (2014, 39th). This is the first time I’ve actually named them out and I’m staggered to see that one team’s name came up three times! That’s a fun coincidence. Below is a frequency table for what a team’s adjusted offensive efficiency ranking was and how many times that team won it. There is a split between teams that were ranked first, second, or third in offensive efficiency ratings. Each of those rankings won the championship three times each. I plan on exploring the path teams took when they won the championship. I’m curious to see if teams that had a significantly lower efficiency rating on offense had a favorable draw in later posts. I expect to see the opponents they played had poor matchups or were lower in adjusted offensive efficiency. Naturally there is more to the matchup, but after looking at numbers briefly, the team that is more efficient seems to win more often than not. Be sure to check back for Part II in Exploring the Makeup of a Champion as I explore adjusted defensive efficiencies. As I unpack the different layers to a college basketball team, the hope is that selecting a champion come tournament time is easier! There are 95 days until Selection Sunday which is more of a reminder of how the college basketball season flies by. In this post, I will give my opinions on teams that have impressed so far and teams that have not lived up to expectations. Also included in this post will the weekly recap of the week and, of course, the fastest and slowest games of the week. Plus, games to watch when there is nothing else on television. When compiling this small list of teams that saw success in November, I thought of how expectations of a team prior to the beginning of the season can give way to an impression of disappointment or surprised joy over the course of a season. That reaction is naturally dependent on a team’s results. As I thought more about expectations, Power 5 schools, for the most part, have higher expectations than mid or lower tiered conferences. A lot of that is based on the talent that a team brings in during the offseason, the amount of experience a team has, the coaching staff and their history of success, and a number of smaller details that create a team’s identity. Team’s that have more success have a higher platform to fall from. The opposite is true too – teams that didn’t fare well in previous years don’t have much to explore at the bottom and can create a surprised element of success for a person or fan base. Enough background on my thought process, here’s the list for teams that had their stock rise in the month of November. 1. I’m going to argue that Baylor has played the toughest schedule wit the best results. I don’t think they played the toughest schedule in the country (that belongs to Michigan State), but they have the best results from their tough schedule. Owning wins over Oregon (Dillon Brooks was sitting out), VCU, Michigan State, Louisville, and now a dominating win over Xavier at home, Baylor exemplifies a tough team that can go toe to toe with almost any school in the country. Keep it up Bears, I hope your December treats you well. 2. Arkansas State gets a nod, not only because they beat Georgetown on their turf, but it sure did help. They beat a tough Chattanooga team as well as a Lehigh team that shows promise to be strong in their conference play this year. These Red Wolves would be a fun choice to take town a big time program later this season if they can make it to the tournament (unlikely though). 3. UT Arlington is a curious team to look at. They are efficient at their 2-point shots and guard the arc very well. So well that they own a resume building win over Texas. With their three losses this season to Minnesota, Florida Gulf Coast and a 4-point loss to Arkansas, UT Arlington has potential to provided some excitement come March. 1. Connecticut is slightly more disappointing than the next team I will mention on this list. The Huskies were ranked 18th in the nation to begin this season. My have the projections of what was supposed to be a great year vanished quickly. Connecticut began the season with a few teams that should have been no more than a shrug on the shoulder. Yet, the Huskies lost at home to both Wagner (currently 2-4 with horrendous losses) and Northeastern (currently 4-4 with their own horrendous losses). UConn then traveled to Loyola Marymount where they struggled and eeked out a 65-62 win. After going 1-2 in Maui, Connecticut returned home to host Boston University where they barely won 51-49. Ouch. 2. The Texas Longhorns also began the season as a top 25 team, yet are struggling to put teams away. Beating Incarnate Word by 5 points would be a red flag. Losing to Northwestern, Colorado, and UT Arlington aren’t awful, but when Texas is favored in those games, along with Shaka Smart’s defense, something positive has to happen, right? 3. It’s fun to see where some teams are that lie toward the bottom of college basketball’s long list of Division I teams. Sacramento State is creating an incredible resume of abysmal results. Initially looking at their record, one would believe starting 2-6 would be expected, especially if it’s a school that doesn’t fair well when playing against schools that have more money for recruiting purposes. Well those two wins have come against non-division I schools. What’s worse is that most of their games that they are favored in the rest of the year, are really tossup games. C’mon Hornets, represent that Big Sky Conference proudly! 1.Oregon 128 vs. Savannah State 59, 90 possessions – In an article that Ken Pomeroy wrote up a couple weeks ago, he explored Horace Broadnoax’s change in philosophy for his team in the way it plays the beautiful game. Once a slow paced, grind-out-a-loss, the coach has his team firing 3 pointers at a record pace this year. It won’t be surprising to see Savannah State on here numerous times over the year. 2. West Virginia 108 vs. Manhattan 61, 87 possessions – I’m glad that this game was able to make it this week as a voluminous possession game. West Virginia had 40 steals in this game, a number that is rarely touched. I spent a decent amount of time scouring records online, and couldn’t find a number close to that. It’s something I’m interested in finding, but I’m not sure it’s the most steals in a modern college basketball game. 3. Lipscomb 104 vs. Tennessee Tech 85, 84 possessions – Not much to say here, Lipscomb shot the ball well from all over the floor, making 14 of their 29 3-pointers. 1 (Tie). Saint Mary’s 66 vs. Stanford 51, 58 possessions – Saint Mary’s is a team that is currently living up to their expectations of being efficient while demoralizing opponents. They resemble an intelligent team posed to have a strong result in their conference. 1 (Tie). Holy Cross 55 vs. Albany 49, 58 possessions – This game was close until about a minute left in regulation. Albany was down 2, but after Robert Champion made consecutive 3-pointers, that all but put the game away. 3 (Tie). New Orleans 70 vs. Washington State 54, 59 possessions – The last time New Orleans beat a Pac-12 opponent was 1998. They won this game in convincing fashion, the Privateers won the rebound battle 36-20 and shot 53.7 percent from the floor. This is a nice win to pocket against a Power 5 school, albeit, the Cougars were picked to finish last in their conference. 3 (Tie). Loyola Chicago 65 vs. San Diego State 59, 59 possessions – I’ve been keeping a watchful eye on the Ramblers this year. They have a much better resume to this point than I thought they would. Taking down San Diego State, a team ranked 60th in Sagarin and 47th in kenpom is impressive. I hope that this continues to build as they enter into conference play – they deserve to have some good results this year with the way they have started their year. 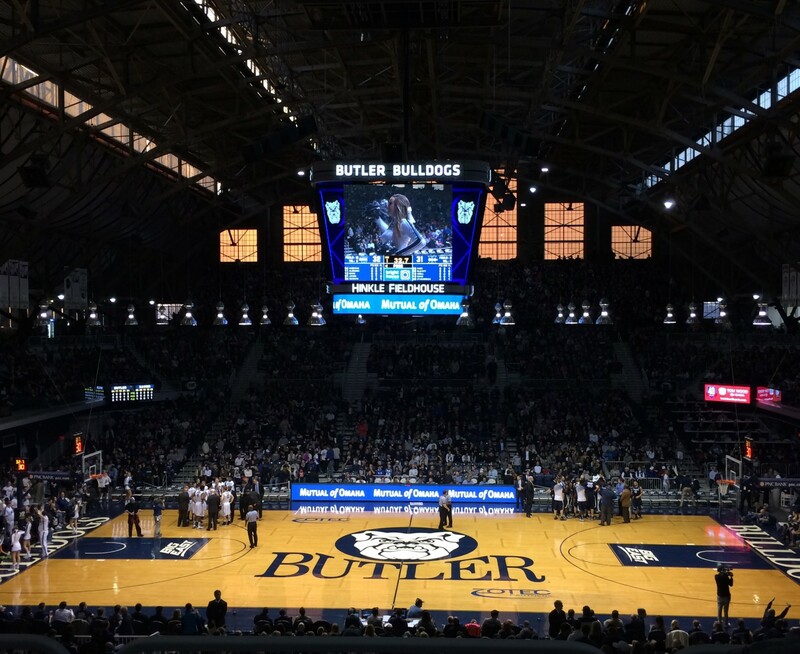 Butler was back in action at home on Saturday, hosting the Cental Arkansas Bears. The Bulldogs did not look crisp. They left talented shooter, Jordan Howard, open to take uncontested more often than not. It wasn’t like someone could have gotten to him either. On more than one occasion, Howard could have taken a dribble into his shot, thrown the ball up, and landed before a Butler player was on him. Not all of the game was poor, however. Avery Woodson continues to make contributions with his 3-point shooting. Kelan Martin was the first Butler player to score 30 points since…Kelan Martin scored 35 against Georgetown last February. The Bulldogs will be tested twice this week when they visit Indiana State Wednesday and host Cincinnati Saturday. Both games will be difficult to win and should provide greater insight into how resilient and grounded the Bulldogs are in their on-court philosophy. The game against Indiana State should be closer than most would expect. Indiana State guards the perimeter well, allowing their opponents to connect on less than 30% made 3-pointers so far this season. They take care of the ball fairly well, averaging a turnover on less than one-fifth of their possessions. They have lost their four games by a combined 10 points. The game against Cincinnati is going to be a slow, grinding game. Cincinnati has a high block percentage, and steal percentage. Not to mention they don’t turn the ball over much either. Ken Pomeroy’s rating has the Bearcats ranked 345th in tempo. They are efficient in getting to the basket and have a high amount of offensive rebounds, grabbing nearly 40% of their missed shots. The starting center, Kyle Washington, is a stud. He owns a double-double this season and has scored in double figures every game thus far. The home environment should be electric when the Bearcats visit. Games like that are always fun to go to. They’re reminiscent of the Butler-Xavier rivalry games. Patience in finding a good shot will be key to Butler victory. They will have to speed the Bearcats up, force turnovers and put points on the board. Based on my growing interest in the scope of following teams over the course of this season, I have begun to identify what I think would be fun, interesting, or exciting games to watch or read about when the contest is over. This week, these are the following games to look for when you have nothing else to do or need something on in the background. UT Arlington at Saint Mary’s, 10:00 p.m.